Just because one doesn't have opposable thumbs doesn't mean they can't both hang out. "I don't mind having a demon friend." In everyday life you're unlikely to know anyone of a different species to yourself, besides pets, and however much you might love your furry/scaly/feathered friends, the relationship probably isn't quite the same as the one you have with your bipedal ones. Animals in question also have a tendency to fight each other over food and territory. In fiction, this restriction is way more lax, especially in the realms of of Fantasy and Science Ficton. Those worlds are populated by a whole host of fantastic aliens, elves, werewolves, robots, vampires, and who knows what else. It's incredibly common for people of completely different species to become close friends. Since the majority of these creatures tend to have an intelligence on par with—if not greater than—that of humans, it might be stranger if people of various species didn't develop some sort of kinship. Even for species that are Always Chaotic Evil, you can expect at least one individual to throw off his hat and say My Species Doth Protest Too Much, thus joining the good guys. Sometimes, in universes where the existence of other magical/advanced races are part of The Masquerade, or there's a lot of Fantastic Racism going on, these friendships might be more limited. This will usually allow people to comment how strange the hero(e)s' friendship is. See Interspecies Romance, when the relationship is less platonic than this. Sometimes overlaps with Odd Friendship. If they are not supposed to be friends, see Forbidden Friendship. Loyal Animal Companion is a Subtrope. See also Androcles' Lion, A Boy and His X, and Predator-Prey Friendship. One of these may lead to a MayflyDecember Friendship. This Android commercial, which very fittingly uses the song "Oo De Lally" from Disney's Robin Hood, whose main characters were an anthropomorphic fox and bear. The bond between humans and their partner Digimon. Ash Ketchum and series mascot, Pikachu. Friendship, trust, and understanding between trainers and their Pokémon are recurring themes on the show. Jesse and James with Meowth. This is different than any of the other examples from this show because Meowth is treated more like a equal than a Mon or pet. This is probably because he is one of the few Pokémon that speak human. Rem (Shinigami) and Misa (human) of Death Note. Rem develops a platonic love for Misa and is even willing to die for her. Light (human) and Ryuk (Shinigami) also fall under this having a few Villains Out Shopping moments together, though they are of a more vitriolic type. Hellsing has Integra and Pip (humans) with Alucard and Ceres (vampires). Wolf's Rain had a pack of wolves and a genetically engineered flower-human hybrid. Kimba and Roger Ranger from Kimba the White Lion. Used with a human scientist who's a friend of Black Jack adopting his last experiment (a super-intelligent deer) and treating him like a brother. It soon went From Bad to Worse. Also between a young fisherman and a whale. Again, it got worse when the whale was blamed for the death of some fishermen. Unlike the scientist and the deer, they get better. Dragon Ball: Goku and most of his friends. But a more prominent example is Gohan (Saiyan/Human hybrid) and Piccolo (Namekian), which looks more like an Intergenerational Friendship, but Piccolo is only four years older. The most notable being Tony Tony Chopper, a reindeer who is a member of the Straw Hat Pirates and a dear friend to the other 8 Straw Hats, who are all human. Luffy and Jimbei, who is a fishman. Later, during the Fishman Island arc, the other Straw Hats become friends with him, too, and all of them befriend a few of the other mermaids and fishmen on the island as well. In the Zou arc, we get the Minks, a race whose appearances range from animal-human hybrids to straight-up talking animals. They are very friendly to the Straw Hats, and have apparently been friends with the human Kogetsu clan, a samurai clan from Wano, for a very long time. One particular, previously established human-Mink friendship is that of Trafalgar Law and his polar-bear-Mink navigator, Bepo, who have been friends for ten years. America and Tony, his alien friend. They've been shown hanging out and playing video games, and America goes to Tony for help regarding the Pict invaders in the movie. England has several magical creatures such as fairies and unicorns that he is friends with. However, with the exception of Norway, no one else can see them. Like England, Norway has fairies and a troll friend that are invisible to almost everyone else. Technically, America's friendship with a young Colonial-era boy named Davie could be considered this as well, since America, while human in appearance, is the immortal embodiment of a nation. Needless to say, this becomes a MayflyDecember Friendship. Tousen and later his lieutenant Hisagi with the anthropomorphic wolf Komamura. Komamura is eventually confirmed to be a member of a clan of werewolves. They're not supposed to consort with others not of their own kind and it took Komamura a long time to build up the friendships he now has in the Gotei 13. Ichigo's group befriend Nel and her companions Pesche and Dondochakka. Humans and Hollows do not get on because Hollows typically kill and consume Humans. Ichigo is also a "substitute Shinigami", and Shinigami have been warring with Hollows for a thousand years. Humans and Shinigami do not typically have the ability to befriend each other. When Ukitake and Hisagi discuss the friendship between Rukia and Orihime, Hisagi finds it weird. Ukitake reprimands Hisagi, pointing out that any friendship should be treasured even if the friends are walking slightly different paths in life. Shinigami and Quincies have been bitter enemies for a thousand years. This does not stop Ichigo (a Shinigami representative) and Uryuu (a Quincy) transforming from enemies to Fire-Forged Friends. Their mutual friends eventually point out they're really Vitriolic Best Buds, much to the horror of both. They actually take after their fathers, as Isshin (a Shinigami) and Ryuuken (a Quincy) have been friends for over twenty years. The reason their friendship has survived for so long is because both men appear to be exiles from their own kind, living in the human world and keeping some enormous secrets from even their own sons. Chrono Crusade: The demon Chrono bonds with his human allies; most notably Rosette. Princess Mononoke: The eponymous heroine was literally Raised by Wolves, whom she considers her family. So much so, that when Ashitaka tried to tell her she was human, she vehemently denied it and said she was a wolf. Natsume and most of his spirit/Youkai friends in Natsume's Book of Friends, including an inukami (a wolf-like spirit) and a kitsune-kodomo (a child fox spirit). From YuYu Hakusho, there is Yusuke and Kuwabara (humans) and Kurama and Hiei (demons). Any friendship Mamoru in GaoGaiGar develops, as he is an alien. The titular InuYasha, who is a half-demon, half-human, with Miroku and Sango, both humans, and Shippou and Kirara, both youkai. Yu-Gi-Oh! GX: Any human and duel spirit friendship, such as Juudai and Hane Kuriboh, Manjoume and Ojama Yellow, or Hayato and Death Koala. The premise of Arashi no Yoru ni revolves around this idea involving a goat and a wolf. Though whether this crosses over to Bromance or Interspecies Romance territory is up for interpretation, especially in the anime when they change Mei's gender. Summer Days with Coo is about a human boy who befriends a Kappa. Hiyori (human) and Yato and Yukine (god/spirit) in Noragami. In Brave Police J-Decker, Yuuta, a ten-year-old human boy, is friends with Deckerd, a Humongous Mecha with a complex AI. Miss Kobayashi's Dragon Maid has Makoto (human) and Fafnir (dragon), along with Saikawa (human) and Kanna (dragon), though the latter one dips into Interspecies Romance. Both also qualify as a MayflyDecember Friendship. Transformers Armada: There's Rad, Alexis, Carlos, and eventually the bullies turned friends, Billy and Fred. The kids even manage to befriend the Decepticon Starscream when he changes sides. Even though he later returns to the Decepticons, Alexis remains friends with him. Transformers Energon: A multitude of humans working alongside the Transformers, notably the Jones family, Misha Miramond, and the now-adult Rad, Carlos, and Alexis. Transformers Cybertron: There are the brothers Coby and Bud Hansen, their friend Lori, scientist Lucy Suzuki, and Colonel Mike Franklin. Naruto (1997) has Naruto, a kitsune child, befriending two adult humans named Takashi and Kuroda. They are his first friends. Naruto grew up not trusting humans because they look down upon him for being a demon. Yo-Kai Watch: Nate is best friends with Whisper (a ghost yokai) and Jibanyan (a cat yokai). A major theme in Sonic X is the human kid Chris' relationship with the Funny Animal hedgehog Sonic. The main characters of Andy Pirki are a dinosaur named Andy and a caveman named Pirki, who are best friends. Mickey Mouse Comic Universe. Mickey Mouse and Goofy. In the X-Men there is Kitty Pryde and Lockheed the Dragon, who is her friend, not her pet. Also in the X-Men there is Cyclops' father Corsair and the other Starjammers (except Hepzibah, who is his lover), each of whom belongs to a different race (except for Sikorski, who is a robot). Longshot and Shatterstar - both from Mojoworld - and their teammates (except for lovers) on various X-teams. Warlock and the other New Mutants. Human Rick Jones and the Kree Captain Marvel (Mar-Vell as well as Genis-Vell). She-Hulk and Jazinda the Skrull. Most of Superman's friendships qualify, though not necessarily Clark Kent's. The Wolfrider elves and their wolves in ElfQuest, partly because they can exchange feelings telepathically, and partly because they're related by blood. Nextwave has a human, two superhumans, a mutant, and a robot. Tom Poes: Tom Poes, a cat, and Olivier B. Bommel, a bear. Jan, Jans en de Kinderen: The cats and the dog of the family are friends with each other. Similarly Eucalypta the Witch is best friends with Krakras, a featherless baby chick. Cubitus: Cubitus the dog and Sémaphore, a human. Urbanus: Urbanus' best friends are a fly, Amedee, and Nabuko Donosor, an alien dog species. Paulus de Boskabouter: Paulus, a wood gnome, is friends with Oehoeboeroe the owl, Salomo the raven and Gregorius the badger. Me Cvimad Moval: A snowman makes friends with a human girl. "The Bremen Town Musicians": A donkey, a dog, a cat and a rooster form a happy company. "Puss in Boots": A boy and his cat. "Old Sultan": An old dog, a wolf and a three-legged cat. "Dog and Sparrow": A tale of vengeance (and how!) for a friend's death. "The Goose Girl" and her horse Falada. "Snow White and Rose Red" and a bear. Subverted, as he turns out to be an enchanted prince and marries Snow White, while Rose Red marries his brother. In The Parselmouth of Gryffindor, Hermione, being most of all a defender of the rights of nonhumans, has many nonhuman friends of her own. They include the Boggart Maximilian, several snakes (most notably the Basilisk, Apophis, Nettle and Tsh), and the magical portrait Minerva. Empath Smurf and Polaris Psyche in Empath: The Luckiest Smurf. Pretty much the plot of Scar The Unsung Hero as the plot is Scar befriending a teenage human. "Human in Equestria" stories are a very common theme in My Little Pony: Friendship Is Magic fanfictions. Fish out of Water comedy or romance stories are most common, but stories involving time travel, alien invasions, and just about everything have been done. Because she grew up in a different country in Bad Future Crusaders, Apple Bloom was raised by and friends with a group of zebras and a gryphon. She is also implied to have been romantically involved with a zebra named Peppercorn. In the Super Mario World/Lucky Star crossover Super Miyuki World, Miyuki Takara befriends Yoshi after freeing him from a question mark block. In Hope for the Heartless, which takes place after the events of Disney's The Black Cauldron, Avalina (a human) befriends not only the resurrected Horned King (a lich), but also his lackey Creeper (a goblin) and the remaining gwythaint she names Taranau Adeon (or Addie in short). She's also quite close to Mitternacht, her Cool Horse. Also, Mitternacht and Addie become close playmates through the races they have with Avalina riding Mitternacht and Creeper riding Addie. The circle later gets an addition in the form of Gethin, Addie's baby. The circle includes also the four Invisibles, invisible creations of the Fates themselves. They're certainly fond of Avalina (she also likes them), but they lean more towards Vitriolic Best Buds territory with the Horned King and Creeper. Many Jurassic World fanfictions display the idea of Rexy (a Tyrannosaurus rex) and Blue (what the film calls a "Velociraptor") becoming friends after the film's climax (certainly helped by the look they give each other at the end). Some fics like to add the Mosasaurus to the mix too. In This Bites!, once Su gets her voice as a Little Miss Snarker, she and Soundbite get along like a house on fire. Likewise for Boss and Franky, due to similar attitudes. Persona 3 Momento Umbrae has Hamuko Takahashi and Kana, a Shadow who originally took on the former's appearance when they were both children to help her escape from the research facility she was locked up in. They eventually start to see each other more as genuine sisters though, with Kana referring to Hamuko as "Oneesama" and Hamuko showing concern for her like any older sister would. In Adorable Murderbeasts, Superboy quickly bonds with Red's Chesnaught after the mission to Santa Prisca. At first, it seems to be because their similar strength and toughness means they work well together in a fight, but it quickly develops further than that. Of course, given his ability to befriend Wolf and the Super-Cycle in canon, this isn't that surprising. In Fallen Angel, Amy (a hedgehog) befriends Sarah (a human) after they meet in a shelter after Perfect Chaos' attack. Neither a Bird nor a Plane, it's Deku! : As a Kryptonian boy living amongst humans, all of Izuku's friendships are this by default, but it's downplayed in that he's culturally human like his peers. In the Miraculous Ladybug fanfic je t'ai promis (que je te retrouverais) Lila Rossi is actually the latest identity of a millennia-old huli jing, thus her friendship with a human princess and her reincarnations are this. Mickey Mouse, Donald Duck and Goofy (dog?) going back to before World War II. Genie (a genie) and Aladdin (human) in Aladdin. Before meeting Genie, Aladdin's best friend is Abu (a monkey). In The Lion King, Zazu (bird) and Mufasa (lion). Also Timon (meerkat) and Pumbaa (warthog), close friends who later befriend Simba (lion). In Hercules, Herc, who is a demigod, has Pegasus, a flying horse, for a companion, and his mentor, Phil, is a satyr. The Fox and the Hound. Between, well, a fox and a hound. Lilo & Stitch, a human and a genetically-engineered alien monster. This is emphasized more in the rest of its franchise, in which more genetically-engineered aliens befriend the human. Brother Bear: Kenai (a human turned into a bear) to Koda (a bear cub). Alternatively, two bears and Rutt and Tuke (two moose brothers). In Finding Nemo, not only do different kinds of fish get along, but they also befriend sea turtles, and species that otherwise prey on fish, such as sharks and pelicans. The Jungle Book has Mowgli the human (who was raised by wolves) befriending Baloo the bear. They also friends with Bagheera the black panther. Oliver & Company has Oliver the cat befriend Fagin's dogs. The Rescuers, along with its sequel, involves mice talking to and befriending humans. The first even has a cat talking to and befriending both humans AND mice. The sequel also has Cody feeling very attached to Marahoute the eagle, though they can't communicate with each other. Bolt has a trio of three different species: Bolt (a dog), Mittens (a cat) and Rhino (a hamster). Toy Story: While Andy does not know his toys are alive, they do care a lot about him. Woody in particular gos to great lengths to return to him when separated. Said toys are also True Companions with each other. 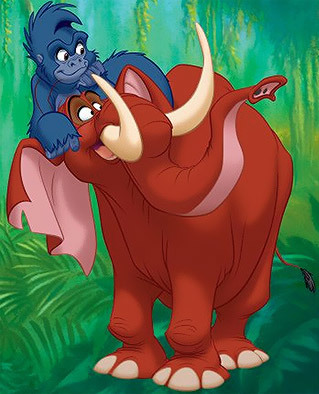 The title character of Tarzan is friends with a gorilla and an elephant. A Bug's Life has several different insects and arthropods as friends. In Mulan Mushu the dragon is friends with Mulan (human), Crikee (cricket) and Khan (horse). Villain Shan Yu has his falcon. Ratatouille has Remy (rat) and Linguini (human). Frozen has a few. Kristoff and Sven the reindeer, who, though he doesn't talk, shows a degree of intelligence and sentience; Kristoff and the trolls; Anna and Olaf the snowman. Zootopia has Nick Wilde (a fox) and Judy Hopps (a rabbit) becoming best friends. Although there are some serious hints this may lead to an Interspecies Romance later. In An American Tail, Fievel Mousekewitz (mouse) makes friends with Tiger (cat). They even have a song together . In The Land Before Time, a long-neck (Apatosaurus), three-horn (Triceratops), swimmer (Saurolophus), flier (Pteranodon) and spike-tail (Stegosaurus) overcome their parents' generations-long racism and become True Companions. A sequel adds a sharp-tooth (Tyrannosaurus rex) to the gang and the TV series adds a fast-runner (Oviraptor). Shrek, (an ogre) Donkey and eventually Puss in Boots become friends in the Shrek films. The wolf-dog Balto is friends with a Russian goose and two polar bears. The title character of Spirit: Stallion of the Cimarron Spirit (a horse) appears to be friends with an unnamed bald eagle and he later befriends a human. Hiccup and Toothless in How to Train Your Dragon. In Home, Oh (male Boov) eventually forms an unbreakable bond with Tip (female human). Maleficent: The title character is a fairy. She befriends a human at the beginning of the plot, and is also friends with beings that don't look like they're the same species of fairy. Dragonheart: Draco (the world's last dragon) and Bowen (a knight-turned-dragonslayer) form an unlikely friendship, which is seen as unusual since dragons and humans consider each other their greatest enemy. The original Star Wars trilogy had Han Solo and Chewbacca, the Wookie, as friends and partners. As with the books, in The Hobbit, a friendship was struck up between Bilbo (a hobbit) and Gandalf (disguised as more or less human), not to mention Bilbo's friendship with the dwarves. The Fellowship is composed of hobbits, men, an elf, a dwarf and a Maia. There was already a strong friendship between Aragorn (a human) and Legolas (an elf) and one would develop between Legolas and Gimli (a dwarf), the ones pictured above. Gimli: Never thought I'd die side-by-side with an elf. Merry and Éowyn, and Pippin and Faramir, hobbits and humans respectively, also become quite close. Being a Friend to All Living Things that she was, Giselle from Enchanted was close to all her animal friends, particularly Pip the chipmunk. It takes most of the film, but one develops between Kirk (human) and Spock (half-Vulcan, half human). Sam and Bumblebee in Transformers, as well as Captain Lennox and the rest of NEST with the other Autobots. Kevin Flynn and the program TRON. In District9, Wikus and Christopher, a human (in the beginning, at least) and an alien respectively. Any relationship with Thor in Marvel Cinematic Universe. Everyone in Guardians of the Galaxy since none of them share the same species. In the Hurog duology, Ward befriends ... some people who are only part human. Axiel, a half-dwarf, and Oreg, a part-dragon. Though Ward himself has dragonblood, too. The Jungle Book, The Second Jungle Book, and the Just So Stories by Rudyard Kipling are full of friendships between humans and animals - Mowgli, the adopted wolf and friend of Baloo the bear, Bagheera the panther, and Kaa the python is only one example of many - and between different species of animals. Winnie-the-Pooh: Features a human boy and his friends, who are toys a bear, pig, tiger, rabbit, donkey, owl, and two kangaroos. The animated series adds a gopher. Guild Hunter features a number of angel-vampire, vampire-human and human-angel friendships. Psy Changeling features a number of psy-changeling, changeling-human and human-psy friendship. In The Sorceress's Orc, the human student Amethyst and the orcish bodyguard Kiki become close friends. The Twilight books and films, which feature friendships and romance between humans and vampires, werewolves (technically shape shifters) and humans, and friendships between werewolves and vampires. In the book Fire World, Rosa (A human) and Alleron (A Firebird) are friends. In The Lord of the Rings, the Fellowship consists of representatives of five species and races (Elves, Humans, Dwarves and Hobbits, plus Gandalf the Maia). Hobbits Pippin and Merry also later become friends with the Ent Fangorn, while Gandalf numbers Gwaihir the Wind-Lord (an intelligent eagle) among his friends. A number of examples from the Discworld novels, notably in the Ankh-Morpork Night Watch, starting with Detritus the Troll, Cuddy the Dwarf, and Angua the Werewolf in Men at Arms. Good Omens has Aziraphale (an angel) and Crowley (a demon). The Book of Night with Moon has Arhu (a cat) and Ith (a t-rex). Dragonriders of Pern in which humans form lifelong bonds with intelligent dragons. Animorphs has Ax, an Andalite, and the five human characters. Or four human characters and one red-tailed-hawk/human/Andalite (Tobias). The team also count Hork-Bajir and Chee among their friends and allies. Cassie even befriended a Yeerk. The core premise of Dinotopia is human/saurian friendship. And human/prehistoric mammal friendship, and etc. When they're close enough, they are called "nestfriends", bringing to mind a common sight in the books: babies and children of different species being raised together, sometimes literally with time spent in nests. If You Give a Mouse a Cookie has a friendship between the eponymous mouse and the nameless protagonist. Harry is friends with Dobby, a house-elf, which is considered odd because most wizards treat them as inferior slaves. Before him, Regulus Black had a similar relationship with his house-elf Kreacher. Harry, Hermione, Ron and a fairly large number of the Hogwarts staff are also friends with Hagrid, a half-giant. The slightly strained relationship with Hagrid's full giant brother, Grawp, might fit this trope better, though. In Order of the Phoenix the murderous giant Golgomath is friends, or at least friendly with, the Death Eater Walden Macnair. They apparently bond over their shared passion for violence and it probably helps that Macnair supported Golgomath in usurping the previous Gurg of the giants who wanted to ally with Dumbledore and then hunt down and kill those giants who opposed him taking over. Depending on whether or not you count werewolves as a different species, all of Remus Lupin's friendships could count as this. Lyra Belaqua (human) in His Dark Materials becomes close friends with Iorek Byrnison and Serafina Pekkala, an armoured polar bear and a witch respectively. In the Inheritance quadrilogy you have riders and their dragons. You also have friendships between humans, dragons (outside their riders), elves, dwarves and werecats. Eragon (a human) in particular has several friends from other races, including Arya (an elf), Orik (dwarf) and Solembum (a werecat). Trull, a Tiste Edur develops a deep friendship with the undead T'lan Imass Onrack in House of Chains. Spinnock Durav, a Tiste Andii upholds a friendship with the human Seerdomin in Toll the Hounds. It is also remarked that Spinnock is among the very, very few Andii who mingle with the human population of Black Coral. In Temeraire the bonds between dragons and their captains probably go beyond even friendship. However, even if you're not that dragon's captain, close friendships exist. One of the things that marks the Aviators apart from everybody else is that they see dragons as equals, while practically everyone else think they're just talking beasts of burden. The Artemis Fowl series contains quite a lot of this, especially between human Artemis Fowl and high-tech fairy Holly Short. The Second-Stage Lensmen of E.E. "Doc" Smith's Lensmen series are all good friends: Kinnison of Tellus (human), Worsel of Velentia (Dragon with multiple eyes on stalks, multiple hands and arms, and a multi-compartment mind), Tregonsee of Rigel IV (Oil-drum body with four legs, four branching tentacle-arms, and no eyes or ears - uses a "sense of perception" instead), and Nadrick of Palain VII (Whose appearance cannot be described because his species has a metabolic extension into the fourth dimension). And it's hinted that these sorts of friendships are not all that unusual among Lensmen or in the Galactic Patrol in general. In Don Quixote, it is mentioned that Don Quixote's horse Rocinante and Sancho's donkey Dapple develop a close bond of friendship throughout their adventures. In Out of the Silent Planet, Ransom befriends Hyoi, hross (otterlike Martian). In That Hideous Strength, friendship between she-cat and bear (rather normal ones) is shown. In Vampire Academy, Rose Hathaway is a dhampir, Sydney Sage is a human. They are reluctant friends, though their species rarely interact. The Alchemists, Sydney's organization, think all vampires and dhampirs are evil. So the friendship between them is rare. Paul the silicon-based alien and Indira in Alien in a Small Town. In The Traitor Son Cycle, human archer Cully becomes best friends with boglin archer Urk of Mogon after the former is amazed by the latter's skill during a competition. Firstborn revolves around a magpie befriending a wolf pack. In Smallville, any friendship involving Clark, obviously. Dean (a human) and Castiel (an angel). Begins as a Forbidden Friendship, as Castiel is not supposed to develop an emotional connection with his charge, on the grounds that it could impair his judgment. The forbidden aspect becomes moot when Castiel rebels against Heaven, which is also forbidden. Also, Dean's brother Sam and Castiel after they grow closer over the seasons (although, to quote Castiel, he and Dean do share a more profound bond). Sam, as a child, became friends with Amy, a kitsune who goes on to save Sam's life. Dean, however, saw her solely as a supernatural threat that needed to be eliminated and ultimately kills her (right in front of her son, no less) in season 7, triggering a breach of trust in the brothers' relationship. Ironically, Sam was later expected to accept Dean's friendship with Benny (a vampire who helped Dean get out of Purgatory), to which Sam responds by pointing out the hypocrisy of it all after Dean's hostility and actions towards Amy. In Doctor Who, all of the Doctor's companions aside from his granddaughter Susan, as well as Romana, fall under this. A few of the companions also have had an Interspecies Friendship with one another, e.g. Tegan and Nyssa, Bill and Nardole, K-9 and pretty much everyone the tin dog ever met. It's hard to imagine Star Trek without this. Star Trek: The Next Generation has several, including Data and Geordi, Deanna and Beverly, Guinan (El-Aurian) and Picard, Guinan and Ro (Bajoran), etc. Star Trek: Deep Space Nine has Sisko (a human) and Dax (Joined Trill), Kira (a Bajoran) and Odo (a Changeling) who is secretly in love with her, and they (eventually) get together, Jake Sisko and Nog (a Ferengi), and Bashir (a human) and Garak (a Cardassian), among others. DS 9's main cast has a lot of alien characters even for a Star Trek show, so most of the core relationships on the show fall into this category. Star Trek: Voyager has Janeway (human) and Tuvok (Vulcan), and the Doctor (hologram) and Seven (human/ex-Borg), among others. In Babylon 5, there's a particularly odd one between Londo (Centauri) and G'kar (Narn), who are the ambassadors of two warring species—one of which (the Centauri) had previously conquered and enslaved the other—and started out hating each other. Circumstances force them to tolerate and eventually like each other, if a bit snarkily. The more amiable case is between G'kar and Garibaldy, the head of security and human. Buffy the Vampire Slayer and the spin-off Angel had several friendships between humans, vampires, werewolves, and demons. Lexx had a human, a half-human lizard girl, an undead assassin, a robot head, and a living spaceship. Farscape had a human, Human Aliens, and Starfish Aliens. The Stargate team (humans) with Teal'c (a Jaffa). As the series progresses, it also becomes evident that Thor really likes SG-1, particularly O'Neill. They even named the first of their new line of Starships "The O'Neill". They had to blow it up 5 minutes later, but the thought was there. The feelings are mutual though, and SG-1 makes it rather clear that they much prefer the company of Thor compared to the other Asgard. Tracker Mel and Cole-Although Mel is a Half-Human Hybrid, that only came out in the next to last ep of the series, so it was viewed as human and alien for most of it. The Planet of the Apes series had two humans (Virdon and Burke) and an ape (Galen). Roswell, with its human and alien teens. In Grimm, Nick (a human/Grimm) and Monroe (a Wesen/Blutbad). Stiles and Scott remain best friends despite the latter being turned into a werewolf in the pilot episode. Also, Scott's girlfriend Allison Argent, who's human, and Lydia Martin, a banshee. Kali and Jennifer were pretty close in the past despite belonging to different species (the former a werewolf, the latter a druid), although they were torn apart when Kali massacred her entire pack to become an Alpha and join Deucalion, marking the druid's Start of Darkness. SCP Foundation, Characters/SCPFoundation, SCP-530 ("Carl The Variable Dog") . Carl gets along with SCP-529 Josie the Half Cat. The Muppets in general, but especially best friends Kermit the Frog and Fozzie Bear. The Legend of Zelda: Ocarina of Time had the friendship between Saria (a Kokiri) and Link (a Hylian/Human), sans Ship Tease. He was also friends with Navi, a fairy. The plot of its sequel starts with him trying to find Navi after she left him. The Legend of Zelda: The Wind Waker sees Link becoming friends with Medli of the Rito and Makar of the Koroks. There's also his friendship with his talking ship the King of Red Lions, though the latter turns out to actually be an alter ego for King Daphnes Nohansen Hyrule, a fellow Hylian. The Legend of Zelda: Twilight Princess has Link growing a friendship with the imp-like Midna, a Twili. This one also comes with some good amounts of Ship Tease. Midna also develops a friendship with Princess Zelda. The Legend of Zelda: Skyward Sword sees Link becoming friends with the robot-like sword spirit Fi, though it takes the latter until the end to realize it. While all the Guest-Star Party Member characters of the various races in The Legend of Zelda: Breath of the Wild come to respect Link for helping them save their people from the Divine Beasts, Prince Sidon of the Zora is the only one who openly declares Link to be a close friend. The fact that his sister Mipha was in love with Link, which could have resulted in the two guys becoming brothers-in-law if she hadn't been killed, is also a major factor. Early in Suikoden II, the player is given the opportunity to recruit Kinnison and his dog companion (who's actually a wolf), named Shiro. "Sinful Sidekick", which is earned after he witnesses Ragoh's death at Yuri's hands. "Considerate Sidekick", earned after he leads Karol and the others to Yuri, for trying to strike off on his own. Pretty much all of Sonic's friendships fall into this. For example, there's his long-timed friendship between him, a blue hedgehog that can run at mach speeds, and Miles "Tails" Prower, a twin tailed fox... who can fly. Amy's closest friend seems to be Cream. They're a hedgehog and a rabbit respectively. Shadow the hedgehog was created on ARK to help a sick human girl named Maria Robotnik. The two became friends and Maria's death plays a huge role in Shadow's character. Mass Effect, where Commander Shepard can develop close, non-romantic friendships with several different kinds of aliens, and, of course, develop Interspecies Romances as well. Not to mention the ones between NCPs. Notably, of Shepard's consistently closest friends on the Normandy, only one of them is a human (Joker). The others are a turian (Garrus), a quarian (Tali'Zorah), and an asari (Liara). In Dragon Age, no matter your race, you can befriend elves, dwarves, humans, Qunari and the odd Fade spirit. In Cave Story, the group of survivors who band together to get off the island includes three humans, two humans-turned-Mimiga, the remnants of the island's Mimiga village, the two robotic main characters, and in the Golden Ending a witch of unspecified race and...whatever Balrog is. In Super Metroid, Samus can befriend creatures who teach her to Wall Jump and use the speed booster. They survive through the ending, and show up again in Metroid: Fusion. In Metroid Prime 3: Corruption Samus can count among her friends Rundas, a Phyrigisian and Gandrayda, whose species is unknown, though Gandrayda seems to love piling on the Les Yay. Considering humans, dinosaurs, mushrooms, and what not live all in the same kingdom it's only natural this'd show up. For a specific example, Mario and Yoshi are best friends. The Paper Mario series is even more obvious about this, with its focus on storyline and the huge amount of partners Mario has, many of them being friendly versions of Mook species like Goombas, Koopas, Lakitus, Boos, Bob-ombs and many others. Ōkami has Amaterasu, a sun goddess in wolf form, and Issun, a Poncle. The entire Nippon Ichi verse is full of these, since regular humans live side by side with angels, demons, robots, aliens, talking animals, and bipeds with animal aspects. For example: Flonne with Laharl and Etna in Disgaea: Hour of Darkness. An important Aesop in all of the games, but especially Pokémon Gold and Silver and the remakes, is that Pokémon should be friends and partners to their trainers, instead of just tools. The Pokémon Mystery Dungeon series has the Player Character and their partner. Not only are both different especies of Pokémon, but the Player Character is also a human turned Pokémon by some circumstance. In BlazBlue, we have the trio of Noel Vermillion, Tsubaki Yayoi (two humans) and Makoto Nanaya (squirrel girl). This has such a great effect that the formerly prejudiced-for-her-race Makoto is incredibly loyal to those two and makes it her mission to ensure no harms come between them, and anyone who does get horribly killed by her hands (Or so she says for the latter), and the mere thought of her friendship to them is the one thing that enables her to survive the Boundary like Hakumen, and be immune to Terumi's infamous Trolling. Unfortunately, while getting mind raped in her bad ending, it's revealed that deep down, Makoto doesn't trust Noel and Tsubaki either, and she's just waiting for them to reject her like everyone else. We'll see if this comes into play in future games. The vast majority of Kirby's friendships are of the interspecies variety, due to living in a world inhabited by many different sapient species but very few of his own kind. Xenoblade has several examples of this all around the world. Amongst the main party, both Riki (a Nopon) and Melia (a High Entia) have a good friendship between them, and also develop some close bonds with their Homs partners as the game goes on; in one case even growing into unrequited Interspecies Romance. Kingdom Hearts: Most notably, Sora's friendship with Donald and Goofy, and Riku's friendship with Mickey. In Fire Emblem Awakening, any friendship that involves either Panne (Taguel), Yarne (half-Taguel), Nowi (Manakete), Nah (half-Manakete), Tiki (also a Manakete), a female Morgan (if any of the aforementioned women is her mother) and a male Morgan (only if he's fathered by Yarne). In Fire Emblem Fates, any friendship that involves the Player Character (half-dragon), Kaden and Selkie (Kitsune aka fox spirits), Keaton and Velouria (Wolfskin aka sort-of werewolves) or any child of the Avatar (one-quarter Dragon, might have Kitsune or Wolfskin blood). Splatoon 2 features a duo of musicians branded as Off The Hook. One is Pearl, who's an Inkling just like the protagonists of the series. Marina, on the other hand, is an Octoling, who are the Inklings' traditional arch-nemesis. Since the first game featured no friendly Octolings whatsoever, this came as a surprise to many players. Marina witnessed the final battle of the first game, and moved to Inkopolis soon after, where she eventually became a duo with Pearl and ascended to stardom. Following the release of the Octo Expansion DLC (which revealed that Marina was not the only Octoling to defect to Inkopolis following the end of the first Splatoon), it's not uncommon to find Octolings and Inklings hanging out together in the Plaza. The Sea Emperor in Subnautica addresses you as "friend" after you rescue its young, allowing it to die without regrets. Given that the player character never speaks, it's ambiguous how they feel about the situation, but the actual players tend to become emotional. In Delta Rune Kris forms several in Chapter 1 with Susie, Ralsei and Lancer, and seems to get on well with some of his classmates. In Mega Man Star Force, most of the non-villainous aliens (and even some of the villains) end up forging these with their partners for EM Wave Changing, but special mention goes to two particular friendships: The FMian Lyra Note and human Sonia Strumm (who fuse to become Harp Note), and the human Geo Stelar and AMian Omega-Xis (The main characters, who fuse to become Mega Man). The Last Birdling is about the friendship between two children, a human named Tayo and a Birdling named Bimonia. Humans and Birdlings have long hated and fought each other, but neither Tayo nor Bimonia care about that; they just want to be friends. It ends up causing disastrous consequences. As Bimonia's mother puts it: "History can't be changed by a couple of kids." Pretty much every Furry Comic ever. Florence (Uplifted wolf) and Sam (Alien Sqid) in Freefall. The Inexplicable Adventures of Bob! : Bob is friends with dragons, unicorns, bigfeet, aliens, robots, mutants, giants, and furry lab accidents. The Mansion of E has the repair-team of Sprocket and Flange (Gnoll and Helipath), and the idlers Tuft and Dap (Gobule and Gnoll). In Off-White: Hati the wolf and the two ravens. One raven even sacrifices himself for Hati. In Homestuck, between the kids, carapacians, and some of the trolls. The post-scratch kids and Calliope are also friends, though Calliope's abusive brother makes it strained at times. Nebula: Between Mercury, a planet, and Sun, a star. They get along surprisingly well despite their vastly different personalities and the fact that Sun's biology makes it impossible for anyone who isn't a star to even stand too close to him without being burned. In Undead Friend there are a lot of friendships built between humans and ghosts. Ratboy Genius has Happyman and Green Monster. Happyman appears to be human and Green Monster is a ... Monster. Who is green. In Afterlife Labirynth, Vryg the bred (male, Polish bred Wryg) and Waom the wohu (female, Polish uowujka Uaom) are Joseph's friends. In RWBY, any friendship with a Faunus is this. Most notable is Blake (cat faunus) with her human teammates and Velvet (rabbit faunus) with her human teammates. Adventures from the Book of Virtues has two human kids, a bison, a red-tailed hawk, a bobcat, and a prairie dog. Avatar: The Last Airbender has this with Aang and his sky bison, Appa. Later, Aang also befriends a flying lemur, Momo. Aang is a Friend to All Living Things, so it's no surprise he and his team have a Loyal Animal Companion or two. Even when no humans are around, though, it's clear that Appa and Momo are buddies with one another. Sequel Series The Legend of Korra has Naga (Korra's polar bear dog) and Pabu (Bolin's fire ferret) being friends...just after the former tried hunting the latter. Ben 10: Omniverse has Ben with Rook, a Revonnahgander. In Futurama there is Bender and Fry, and to a lesser extent the other members of the Planet Express crew. Also Zoidberg. Fry and Leela appear to be this for several seasons, but it's later revealed that Leela was Human All Along and that her parents are sewer mutants who passed her off as an alien so that she could have a better life on the surface. George of the Jungle comes to mind. In Kulipari: Dream Waiker, Darel's three younger Kulipari siblings, Tharta, Thuma, and Tipi, are friends with Stinger, a scorpion. The unicorn Twilight Sparkle is friends with her assistant Spike, a baby dragon. Fluttershy is friendly with most non-pony animals and beasts (which seem to be more intelligent than real-world animals), and goes on to become the first friend Discord has ever had and reform him to boot. Pony characters have also developed friendships with buffaloes, zebras and gryphons (all of which are sapient species equal to ponies). This is a major plot point in "School Daze", where Twilight opens a school to foster friendship between different species. While the leaders of the various nations quite clearly do not get along with each other, six students of different species — Sandbar the earth pony, Gallus the griffon, Silverstream the hippogriff, Ocellus the changeling, Yona the yak and Smolder the dragon — quickly bond and become fast friends. In the first My Little Pony: Equestria Girls movie, Twilight Sparkle makes friends with the human counterparts of her friends in an Alternate Universe. Her friendship with Flash Sentry even gets this close to being an Interspecies Romance. Starting it was Spike, his father Sparkplug and Carly in Transformers: Generation 1. In Transformers Animated, there was Sari, although she turns out to be half-Cybertronian. Transformers Prime has Jack, Miko, and Raf. The latter two are in some ways closer to their Autobot partners than their biological family, especially Miko. Adventure Time has the two main characters, Jake the dog and Finn the human. There's also Marceline the Vampire Queen and Princess Bubblegum (the anthropomorphic candy). Really though, almost every relationship in the land of Ooo could count as this on account of the world being made up almost entirely of anthropomorphic everything (animals, food, land etc). In 3-2-1 Penguins!, Jason and Michelle, two humans, are friends with Zidgel, Midgel, Fidgel, and Kevin, four penguins. The Silver Brumby, an Australian animated series based off of the titular books, has Thowra (the titular silver Brumby), Storm and boon Boon (two other horses) hang around with Benni (an old male grey kangaroo). They also get along well with other animals like a grumpy wombat, two gossiping emus, a rhyming owl, and a mother dingo. Birds of a Father shows Sylvester, Jr., befriending a bluebird named Spike, much to the chagrin of Sylvester, Sr.
Feed the Kitty has a small kitten named Pussyfoot winning over the heart of an initially brutish bulldog named Marc Anthony. This friendship is seen through all five shorts they appear in together, as Mark Anthony will do anything within his power to make sure Pussyfoot is both happy and safe—even bearing with her claws kneading into his back before she goes to sleep. Go Fly a Kit starts with an eagle with an overactive mother complex adopting an orphaned kitten as her very own offspring. It's such a strong bond that the eagle mother cries when her young kitten flies away by himself—literally. This trope applies, sparingly, in shorts where Daffy Duck appears together with either Bugs Bunny or Porky Pig. Animaniacs has Rita and Runt, respectively, a cat and a dog. However, Runt doesn't like cats, so his friendship with Rita only exists because he doesn't know—or refuses to acknowledge—that Rita is feline. Brian and Stewie Griffin in Family Guy. The former is a dog, while the latter is a baby human. The title characters are a (flying) squirrel and a moose, respectively. A handful of the later Hanna-Barbera Tom and Jerry shorts depict the title cat and mouse as more friendly to each other than they usually are. Star and Marco from Star vs. the Forces of Evil may both look like humans, but the former is actually a Mewman, a species that looks like a human, but are from the dimension Mewni. Seen a lot in Chaotic, as part of the show's main theme is humans getting to travel to a world inhabited by non-human creatures of vastly varied shapes, sizes and looks. The four main characters, all human teens, befriend a good number of creatures throughout the series run. Very prominent in The Backyardigans. The main cast are all the best of friends... And happen to consist of a penguin, a moose, a uniqua, a hippo, and a kangaroo. Just about any series in which the main cast are all Funny Animal types of varying species will be this, though the distinction is blurred, given that the nature of the characters is such that most of the time they act human anyway. Arthur, Franklin, Llama Llama and Timothy Goes to School are all prominent examples. Arthur is an aardvark whose circle of friends includes a rabbit, a monkey and a dog. Franklin's the turtle's best friends are a bear and a snail, and other friends include a rabbit, a beaver and a goose. Llama Llama is best friends with a gnu (wildebeest), as well as friends with a sheep, a goat and a giraffe. Timothy is a raccoon who is best friends with a cat and his other friends include a badger/skunk, a pair of dogs and two mice. The Family-Ness has this between Angus and Elspeth, a pair of human children, and the Nessies, a family of Loch Ness monsters. On Ready Jet Go!, the humans Sean, Sydney, and Mindy are best friends with the alien Jet. Pixar Shorts: Kitbull stars a stray kitten befriending a pit bull that's abused by its owner. At first frightened by the pit bull's scarred appearance, the kitten bonds with the pit bull after seeing how badly it's been abused and forced into dogfighting. They eventually manage to escape together and finally find an owner who treats them very well. They say a man's best friend is his dog. Cats, birds, and horses are also common companions. Really, just about any solid pet/owner friendship. Most domesticated animals quite enjoy human company. And that of other domesticated animals, regardless of species. Even dogs and cats will get along just fine as long as at least one of them is young or submissive enough. Koko the gorilla used to have a pet kitten, and she received two new ones for her 44th birthday. This news story tells of Gohan and Aochan - a dwarf hamster and rat snake, respectively - who peacefully share an enclosure at a zoo in Japan (or shared, most likely, due to the average lifespan of hamsters and the article being written in 2006). Gohan was intended to be Aochan's lunch when the snake refused to eat frozen rodents, but Aochan never showed any hostility, eventually taking to frozen food. They got along so well that Gohan could safely climb onto the snake's back to take naps. An old man named Dominic and a goose known by locals as "Maria "note now known as "Mario" after they discovered that the goose was in fact a male from Echo Park suddenly started following him and has been doing so ever since. The goose would even scare away people and other animals whenever they get anywhere near the old man. There is a show on the channel Animal Planet called Unlikely Animal Friends that has many examples of this trope. Warthog and baby rhino, boar and cows, baboon and bush baby, etc. Happens a lot on Too Cute, particularly between kittens and dogs. The French racehorse Allez France shared its box with a sheep. It turns out that horses and goats or sheep make very good friends. This is actually where the term "Getting your goat" came from: owners of racing horses would give them goats as stable companions, and sometimes before a race someone would kidnap the goat to make the horse perform poorly. This grizzly bear and wolf cub , even after six year they were still together! It seems it's not just grizzlies, polar bears and wolves also make fast friends. At Noah's Ark animal sanctuary in Georgia, an African lion, a Bengal tiger, and an American black bear all share the same enclosure. The three were rescued from a drug dealer's house as cubs, and they have lived together as the best of friends for over a decade, even acting out and getting distressed when sanctuary personnel temporarily remove any one of the "brothers" for medical treatment. What makes the arrangement even more unusual is that black bears and Bengal tigers in the wild are solitary creatures who rarely associate even with their own kind. Also, wild Bengal tigers eat bears that size. Wolves and ravens have a propensity for this in Real Life, ranging from sharing kills to playing together. Solo was an African Wild Dog who lost her pack. She was eventually accepted by a clan of hyenas and then a family of jackals. What's amazing is that all three species are mortal enemies. It's common practice at zoos and wildlife parks, when a young big cat, wolf, or bear is orphaned or rejected by its mother, to bring it up in the company of a domestic dog. The dog provides a playmate from which the motherless cub can learn social cues, and also demonstrates that their human caretakers are trustworthy by being friendly to people too. Bottlenose dolphins have been known to develop this kind of relationship with false killer whales. Not only do they cooperate in hunting for fish and squid, but they also are able to communicate with one another. Some dolphins form bonds with individual false killer whales, and become companions with them for years. The two species appear to understand each other's calls to some extent, and there are even accounts of false killer whales mating with bottlenose dolphins. People who keep pet mice can't allow males to live with one another, as they fight when confined together. Nor can they be housed long-term with female mice unless neutered, which is risky surgery for such tiny pets. Rather than leave a male alone, it's increasingly common to house them with female African soft-fur rats (Mastomys natalensis), which are gerbil-sized and get along well with true mice, grooming and snuggling together, yet can't interbreed. This video showcases a feral cat who wandered into a bear's enclosure at a zoo, befriended it, and now lives with it. Bonedigger is a male Barbary lion living at the G.W. Exotic Animal Park in Wynnewood, Oklahoma. The animals he gets along with very well are a family of dachshunds, especially a female named Abby (whom he had been friends with ever since they were a cub and puppy).